de Souza e Silva, A., & Gordon, E. (2013). The waning distinction between private and public: Net locality and the restructuring of space. In K. Gates (Ed.). The International Encyclopedia of Media Studies, volume VI: Media Studies Futures (pp.195-214). Boston: Blackwell. de Souza e Silva, A. (2013). 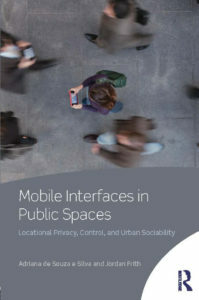 Location-aware mobile technologies: Historical, social, and spatial approaches. Mobile Media and Communication, 1 (1), 116-121. DOi: 10.1177/2050157912459492. Translation in Portuguese: de Souza e Silva, A. (2013). Tecnologias móveis de posicionamento: Abordagens históricas, sociais e espacias. Verso e Reverso, XXVII (64), 19-23. DOI: 10.4013/ver.2013.27.64.03. Shklovski, I., & de Souza e Silva, A. (2012). An urban encounter: Realizing online connectedness through local urban play. Information, Communication and Society, 16 (3), 340-361. DOI: 10.1080/1369118X.2012.756049. de Souza e Silva, A.. (2011). Art by Telephone: From static to mobile interfaces. In M. Rieser (Ed. ), The Mobile Audience: Media art and mobile technologies (pp. 67-80). Amsterdam: Rodopi.